Do worms eat dog poo? Yes worms do eat dog poo and cat poo and kitty litter as long as it is a paper or timber based product. Recent research by us and a Vet in the USA has shown that modern animal worm medications do not harm compost worms. Therefore recently wormed animal poo is safe to use in your worm farm as a worm food. Add plenty of high carbon material with dog poo, material such as shredded cardboard, dry leaves, aged compost, peat moss or coco coir. Ironically these high carbon materials are called “browns”, yet dog poo is considered a “green” food because it is high in nitrogen. The ideal worm farm for feeding dog and cat poo to is our own Little Rotter. They are simple, safe and easy to use. Check them out in our “Store” page. Do we sell worms to South Australia? Its a long way from Queensland. Yes, we do sell worms to South Australia. In fact we sell our worms all over Eastern Australia. We have also received approval to send worms to Tasmania. Do we currently have worms in stock? Yes, we have worms in stock all year round. We breed our worms in a climate controlled shed. This means that we are not reliant on the weather before our worms will breed. We believe that we are the only worm farm in Australia that can supply worms all year round. We also breed ALL of our own worms. We do not have to rely on other worm farmers for worm stocks, so we can supply your order immediately we receive notification of your payment. How many worms do I need for my plastic bin worm farm (Reln Worm Farm, Can-O-Worms, Tumblweed Worm Farm)? We recommend that you initially buy 1000 compost worms for each member of your household. Therefore, if you have 4 members in your household, your worm farm would work best if you ordered 4000 compost worms. 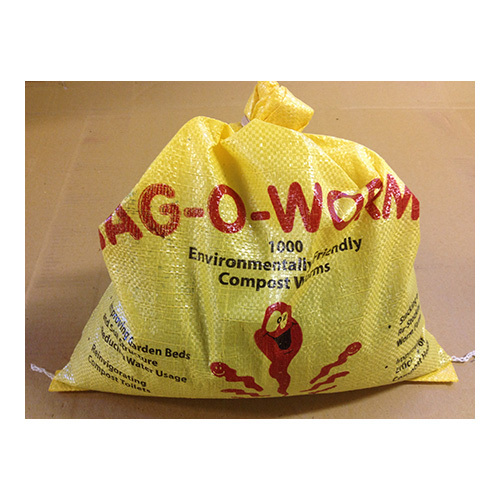 You can buy 1000 mature worms in our Bag O Worms and make up the remainder with our Compost Worm Bombs which have smaller worms and eggs and are therefore much cheaper. Your worm farm will still work with less worms, but it will be much slower in converting waste. What are the best foods for my worm farm? Compost worms will eat most things that have been living, but are now dead and rotting. They actually prefer to eat the micro-organisms that are causing the organic matter to rot. Worms have no teeth, so rely on other organisms to break down their food first. Kitchen scraps are a good food source for worms. Other household wastes that are good for worms include paper, cardboard, lawn clippings, animal poo, leaves etc. If you don’t like maggots, don’t feed your worms meat. Remember that worms do NOT have teeth, so chop, shred or mush the worm food first. Also remember that worms like a varied diet, just like all animals. So mix your food up and try to vary it as much as possible. Everything in moderation. How much food do I feed my worms? It has been said that Compost worms will eat up to half their body weight per day. In our experience, this figure varies tremendously. We have fed our compost worms from as little as 1/100th of their body weight per day (bran) to as much as 10 times their body weight per day (mill mud/filter press). It all depends on the type of food, what particle size it is, what its nutrient content is etc etc. If you mainly feed your worms kitchen scraps and you chop or mush them up, you can expect 1000 worms to eat 1/2 a cupful (125 ml) per day. Will my worms breed too much and overcrowd my plastic bin worm farm? No, compost worms have a natural mechanism that stops them from breeding when they get to a maximum food/volume density. This means that the worms will self-regulate their population depending on the amount of food you give them and the space in which they are kept. How many worms do we breed? We can breed between 2-3 tonnes of European Night Crawlers per year and 1-2 tonnes of compost worms per year. We are still growing and may well be breeding much higher volumes in years to come. How much worm cast do we produce? On average our worms produce 2 cubic metres of worm cast per week. How long have we been breeding worms for? Kookaburra Worm Farms was established in 2003. George first worked with worms in the early 90’s when he was the founder of a company called “Waste Organic Recycling Management Systems” (W.O.R.M.S.). How long does it take to deliver my worms? Can I put these worms into my garden? We have 4 varieties of worms. Some will survive well in most gardens, others will need a good cover of mulch and plenty of water to allow the worms to survive. Perhaps a better way to go is to use our Little Rotter Worm Farm which provides the perfect environment with food and moisture for the worms. You can look up this Little Rotter Worm Farm on Our Products page. Do we supply the worm blankets for the Can O Worms? No, at present we do not supply the worm blankets. In our experience, worm blankets are not a necessity for a worm farm. The blankets can help keep moisture in and keep the food dark so that worms can eat 24 hours a day. Damp newspaper, cardboard or carpet will do the same job. The Tumbleweed worm blankets are available from most Bunnings stores. I am really interested in the Little Rotters Mini - I think its a great idea, and so is your price. I was wondering about it having a base as others I have seen don't. Do you think this makes a difference? Can you dig it a bit deeper into the bed so that it is hidden a bit more? And does it encourage earth worms too? I notice that you supply compost worms with it and not earthworms. Is there much difference. Thank you - still learning lots! The base on the Little Rotter is very important from a rodent perspective. If the in ground based worm farm does not have a base, then it is very prone to rodents (rats and mice) digging their way in from underneath and not only eating the food scraps, but eating the worms as well. This was a major problem when we were doing testing on the Little Rotter prototypes. The final design that we came up with was a bin with a base, but with 9 small holes drilled in the base which allows the worms easy access, but restricts the rodents from getting in. It is not a good idea to dig the Little Rotter (and for that matter any other style of worm farm) into the ground. The worms have a natural tendency to level any organic matter/food to the surrounding soil level. So, if you dig a Little Rotter in the ground, the worms will FILL it to the surrounding soil level. If you place the Little Rotter on top of the ground, then the worms will continuously EMPTY it for you. To hide the Little Rotter in your garden it is possible to place light fluffy mulch up around it. Something like cane fibre mulch available from Bunnings or any other good quality mulch. We actually encourage the use of mulch around the garden to help protect the worms from the elements. Compost worms in the garden do appear to assist in attracting soil worms. Soil worms are generally deeper dwelling worms that create “structured” soil. Structured soil helps to hold plant roots down and stopping the trees from toppling over, they hold nutrients and water really well and have many small worm tunnels that assist in letting air down into the soils to help the soils to breath and hence be healthier. Compost worms add nutrients to the soil with their worm cast. They are generally surface-dwelling worms which make a fine granular worm cast that is nutrient rich, but lacks “structure”.